When I was growing up, everybody expected the world to eventually go up in flames. I mean, this was during the heyday of the Cold War. Had you asked any adult in the mid-1960s, anywhere in North America or Europe, if the world would survive without nuclear Armageddon to the year 2000, most would have said, not a chance. Even Star Trek predicted a global conflict sometime in the mid-1990s. And we no longer seem to be concerned with civil defense. But back in the 1950s, 1960s, that was not the case. In the “duck and cover” era, civil defense was very important. 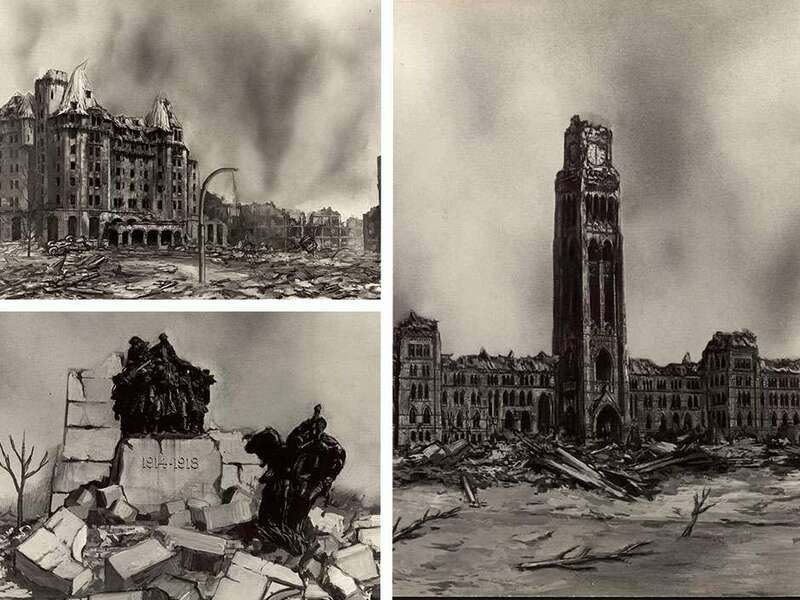 And thus it came to be that Canada’s Emergency Measures Organization even commissioned illustrations that show well-known Ottawa landmarks turned into ruin by war. The images of the Chateau Laurier, Parliament’s Peace Tower, and the War Memorial appear uncannily realistic. Almost photographic in quality, they could serve as storyboard images for a post-apocalyptic computer game. Much as I like computer games like that, such as the Fallout or Metro series, I hope we never get to see in reality what these images depict.